Stress is something that most people have to deal with on a daily basis. Appropriate levels of stress promote powerful benefits throughout the body, yet when the systems associated with stress are routinely activated, the body may not respond as we would like. In response to stress, the hormone corticotrophin-releasing factor (CRF) is released from the hypothalamus. A primary function of CRF is to act on the anterior pituitary to stimulate the release of adrenocorticotropic hormone (ACTH), which in turn stimulates the synthesis of cortisol, glucocorticoids, mineralocorticoids, and DHEA.1 While CRF is very important for the acute stress response, its presence can have some potent effects throughout the body. 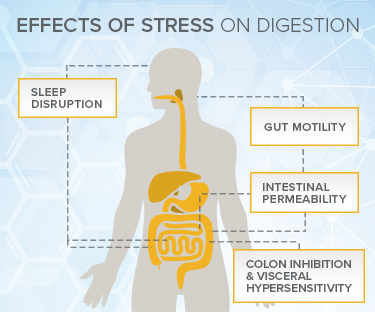 The effects of stress throughout the body are quite pervasive and the effects of stress on digestion can be widely occurring with several discussed below. If you are not intimately familiar with these proteins and the clinical application of them, you are not alone. These are relatively new therapeutic targets thanks in large part to the late Shoichiro Tsukita and his successors.3,4 The higher the levels of these are, the “tighter” the paracellular junctions are and the less likely antigen proteins would interact with the immune system. Motility (the contraction of the muscles that mix and propel contents in the gastrointestinal (GI) tract) is an important aspect of healthy digestive function. The efficient movement of ingested nutrients promptly supports appropriate digestive processes and proper microbial diversity. Studies suggest that the stress response impacts the powerful system referred to as the gut-brain axis. A 2016 study suggests that myenteric neurons can be signaled resulting in increased inhibitory neuromuscular transmission, impacting bowel transit time.7 In this animal model, one cellular mechanism of stress and bowel function were demonstrated. In this case, the model stress causes decreased transit time and diarrhea. In rat models, CRF was shown to activate myenteric neurons and increase neuronal excitability of colonic tissue.8 This sheds new light on the interplay between the immune system and specific cytokines with the functioning of the bowel. Indeed, a multipronged approach to support bowel function may be necessary which includes addressing systems that interact with the gut either at an intimate level or rather remotely. What is fascinating about this particular study is that both the immune-mediated factors and stress-mediated factors had to be mitigated in order to restore homeostasis in the model. Promoting healthy stress tolerance and optimal GI function can be difficult. I have found that prioritizing the aspects of digestion based on individual needs has resulted in consistently positive outcomes in my patients. Resources such as the Gastrointestinal Restoration Program provide me with a foundation to guide my recommendations and help me to prioritize aspects which are most important to an individual’s plan. Integrating this program into my practice was effortless and rounded out my supplement recommendations to address patients different needs. Christopher Oswald is a Certified Functional Medicine (CFMP) and Certified Nutrition Specialist (CNS) practitioner. He practices at Metabolic Treatment Center in Wisconsin, focusing on digestive health, energy, comfort, and performance. In practice he develops strategic plans for patients focused on systematically addressing concerns. He has supported the dietary supplement industry by creating tools for practitioners to improve patient and practice outcomes as a medical educator, speaker, content creator, and strategic advisor. Christopher is continuing his graduate education with an MBA with specializations in data analytics and finance at St. Mary’s University of Minnesota. Hall JE, Guyton AC. Guyton and Hall textbook of medical physiology. 10th ed. Philadelphia , PA: Saunders; 2004. Zheng G, Wu S-P, Hu Y, et al. Corticosterone mediates stress-related increased intestinal permeability in a region-specific manner. Neurogastroenterol Motil. . 2013;25(2):e127-39. Takeichi M. Shoichiro Tsukita: a life exploring the molecular architecture of the tight junction. J Cell Biol. 2006 Jan 30;172(3):321-3. Anderson JM. The life and work of Shoichiro Tsukita. Ann N Y Acad Sci. 2009 May;1165:7-9. Wiles TJ, Jemielita M, Baker RP, Schlomann BH, Logan SL, Ganz J, et al. Host Gut Motility Promotes Competitive Exclusion within a Model Intestinal Microbiota. PLoS Biol. 2016 Jul;14(7): e1002517. Chang Y-M, El-Zaatari M, Kao JY. Does stress induce bowel dysfunction? Expert Rev Gastroenterol Hepatol. 2014;8(6):583-5. Reed DE, Zhang Y, Beyak MJ, et al. Stress increases descending inhibition in mouse and human colon. Neurogastroenterol Motil.. 2016 Apr;28(4): 569-80. Buckley MM, O’Halloran KD, Rae MG, Dinan TG, O’Malley D. Modulation of enteric neurons by interleukin-6 and corticotropin-releasing factor contributes to visceral hypersensitivity and altered colonic motility in a rat model of irritable bowel syndrome. J Physiol. 2014;592(Pt 23):5235-50. Ali T, Choe J, Awab A, Wagener TL, Orr WC. Sleep, immunity and inflammation in gastrointestinal disorders. World Journal of Gastroenterology : WJG. 2013;19(48):9231-9. Pratte MA, Nanavati KB, Young V, Morley CP. An Alternative Treatment: A Systematic Review of Human Trial Results Reported for the Ayurvedic Herb Ashwagandha (Withania somnifera). J Altern Complement Med.. 2014;20(12):901-8. Konturek PC, Brzozowski T, Konturek SJ. Gut clock: implication of circadian rhythms in the gastrointestinal tract. J Physiol Pharmacol. 2011;62:139–50. Hu M-L, Rayner CK, Wu K-L, et al. Effect of ginger on gastric motility and symptoms of functional dyspepsia. World J Gastroenterol. 2011 Jan 7;17(1):105-10. Lazzini S, Polinelli W, Riva A, Morazzoni P, Bombardelli E. The effect of ginger (Zingiber officinalis) and artichoke (Cynara cardunculus) extract supplementation on gastric motility: a pilot randomized study in healthy volunteers. Eur Rev Med Pharmacol Sci. 2016;20(1):146-9. Sadraei H, Asghari G, Kasiri F. Comparison of antispasmodic effects of Dracocephalum kotschyi essential oil, limonene and α-terpineol. Res Pharm Sci. 2015 Mar-Apr;10(2):109-16. Sanger GJ, McClelland CM. Increased gastric cholinergic activity evoked by 5-hydroxy-L-tryptophan in the rat. Eur J Pharmacol. 1986 Aug 15;127(3):179-85. Wang B, Wu G, Zhou Z, et al. Glutatmine and intestinal barrier function. Amino Acids. 2015 Oct;47(10):2143-54. Salvatore S, Heuschkel R, Tomlin S, et al. A pilot study of N-acetyl glucosamine, a nutritional substrate for glycosaminoglycan synthesis, in paediatric chronic inflammatory bowel disease. Aliment Pharmacol Ther. 2000;14(12):1567-79. Calder PC. Marine omega-3 fatty acids and inflammatory processes: Effects, mechanisms and clinical relevance. Biochim Biophys Acta. 2015 Apr;1851(4):469-84. Sahebkar A, Cicero AF, et al. Curcumin downregulates human tumor necrosis factor-α levels: A systematic review and meta-analysis of randomized controlled trials. Pharmacol Res. 2016 May;107:234-42.